Martin Luther’s classic Easter hymn, Christ Jesus Lay In Death’s Strong Bands. Categories: Music | Tags: Christ Jesus Lay In Death’s Strong Bands, easter, MArtin Luther, Music | Permalink. If you prayed as a Christian in the name of Jesus, completely confident that God hears and accepts your prayer, that’s a fruit of the Reformation. [In addition to other spiritual truths, the Reformation] was also about confidence. Not self-confidence, but confidence that God is for us not against us, confidence that we can go to heaven without a sentence in purgatory first, confidence that though we cannot rest in our works, we can rest in Christ’s. Consider, for example, this powerful reflection from Luther on the confidence we should have in prayer. …one of the things we must never forget to say is that the Reformation mercifully allowed fearful sinners to have a new kind of relationship with God. The Reformation reminded God’s people that they can have direct access to God through Christ. It re-centered the church on the lavish, scandalous good news of the cross. And it reassured them (and us) that God is on the side of the justified saint, even though they were still struggling sinners. Read Luther’s words at DeYoung’s blog. Categories: Assurance, Christian Growth, Church, Church History, MArtin Luther, Prayer, Reformation | Tags: Assurance, Kevin DeYoung, MArtin Luther, Prayer, Reformation | Permalink. This charming Playmobil animation by Go Chatter Videos tells the story of Martin Luther. Watch is a primer for Reformation Sunday tomorrow. Categories: Church History, MArtin Luther, Reformation | Tags: Church History, MArtin Luther, Reformation | Permalink. Preaching that is full of advice about how people can live like Christians can’t transform, only preaching that points people to God’s transforming power in the person and work of Jesus Christ has the hope of change. The conclusion of an article about Luther’s theology by Phillip Cary at First Things. How we have always been justified by faith alone is best seen in light of Luther’s distinction between law and Gospel. Both the law of God and the Gospel of Christ are God’s word, but the former only gives us instructions while the latter gives us Christ. For the law tells us what to do, but the Gospel tells us what Christ does. The distinction grows out of Augustine’s insistence, in his great treatise On the Spirit and the Letter, that telling us to obey the law of love does not help us do it from the depths of our hearts; only the grace of Christ can give us such a heart. Luther merely adds: The place to find the grace of Christ is in the Gospel of Christ. Categories: Gospel, MArtin Luther, Preaching, The Lord Jesus | Tags: First Things, Gospel, MArtin Luther, Phillip Cary, The Lord Jesus | Permalink. Martin Luther takes up residence in the Batcave annex at mgpc, just in time for the 500th anniversary of the Reformation. I haven’t jumped ship though. John Calvin bobble head still rules the roost. 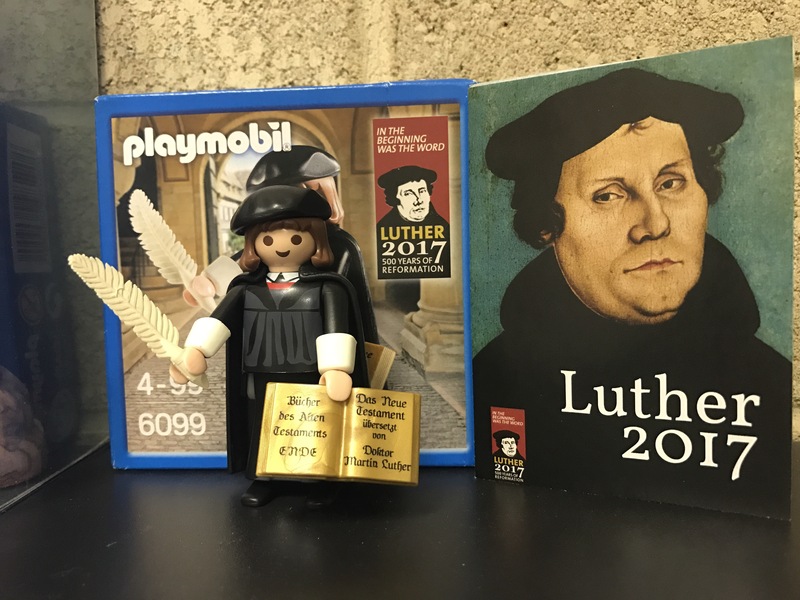 Categories: Church History, MArtin Luther, Toys | Tags: Church History, MArtin Luther, Toys | Permalink.